The eyes are an essential part of the human face. However, many patients may feel unsatisfied with the appearance of their eyelashes due to a lack of volume or thickness. While there isn’t a particular reason for stubby, short, or thin eyelashes, those who wish to enhance and beautify their lashes can do so with LATISSE® treatment. LATISSE® is non-invasive and can provide you with naturally thick and full eyelashes without having to use mascara or extensions. LATISSE® is a non-surgical, at-home treatment that should be applied once per day at the base of your upper eyelashes. It is not intended for use on any other part of the eye. This treatment works by strengthening your lashes during their growth period. LATISSE® can also prolong the duration of growth so your eyelashes grow thicker and longer than they were before. In as little as six weeks, you will begin to see noticeable results. 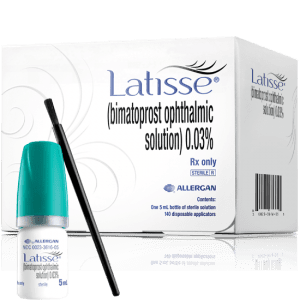 LATISSE® is long lasting and can provide patients with darker, fuller, and more feminine-looking lashes. Your full results will become apparent after 16 weeks of regular use. Patients who wish to stop using LATISSE® may do so at any time. However, choosing to stop treatment will result in your eyelashes slowly reverting to their natural state. As with most cosmetic products, there are some risks involved with LATISSE® treatment. These include redness, swelling, itching, skin darkening, blurred vision, and dryness. If these or other side effects occur, you should seek medical attention immediately.